Seahorse racing will never become a popular spectator sport. There are many reasons for that, not least of which is that they are terrible swimmers. Your average seahorse can only go a few feet before it has to stop and hang on to something while it rests. You wouldn’t be able to fill a huge stadium for seahorse races either, since they are only a few inches in height, with the largest variety topping out at 8 inches. That would make them hard to see from a grandstand. The truth is, they’re pretty hard to see even when you’re in the shallow water around sea grass beds or coral reefs where they like to hang out. I’ve been in their habitat quite a bit over the years, but the first time I encountered an actual living sea horse was at the Ocean Rider Seahorse Farm in Kailua-Kona, on the Big Island of Hawaii. As the name suggests, seahorses are bred there. By the way, when you’re having that birds-and-bees discussion with your kid, you might not want to confuse them just yet by including the details of how seahorses breed. It’s complicated, since the daddy seahorses are the ones that get pregnant. OK, that’s not literally true, but the males do have a brood pouch on their front, into which the female deposits hundreds of eggs. At some point during that transfer the eggs are fertilized. During the gestation period, mom drops by every day for a few minutes to say “hi”, and then swims away. Dad resumes his quest for food, since he’s eating for several hundred. In a few weeks, sea ponies emerge from the pouch. No matter how frisky the seahorses are, they are not reproducing fast enough to keep pace with conditions that are causing the seahorse population to dwindle. Habitat destruction is a factor, and overfishing is, too. It’s estimated that as many as 20 million seahorses are caught and sold annually, mostly for use in traditional Chinese medicine. 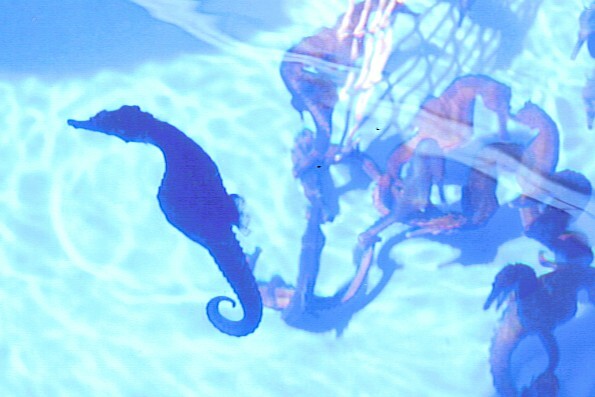 As far as I know, the Ocean Rider Seahorse Farm is not supplying critters for that purpose, but is helping to meet worldwide demand from aquariums and hobbyists. That cuts down the number of seahorses that are taken from the wild, and is a step toward preventing their eventual extinction. The people who operate the Ocean Rider aquafarm maintain high standards of hygiene to keep the little guys healthy. Before we entered, we scrubbed up like we were doctors going into a… well, a delivery room. The highlight of our visit was a hands-on experience. It took a little time for the seahorse to warm up to me, but eventually he wrapped his prehensile tail around my little finger. Our guide told me that this seahorse was named Barney, and that at age 13, he was the oldest in the aquafarm. So we two old guys hung out for a while; then Barney paddled away, probably hoping to find a seamare and offer to carry her eggs. This entry was posted in Science and tagged seahorses. Bookmark the permalink. I would imagine that it would be difficult to enter them in a rodeo! Very interesting. Do they actually paddle? “Paddle” might not be the best verb I could have used, but since seahorses swim upright, the posture sort of reminds me of the dog paddle. Seahorses actually propel themselves with a transparent dorsal fin — it beats at something like 25 times per second. That’s probably why they have to spend so much time resting! Awww….sea ponies. That was a fun day!